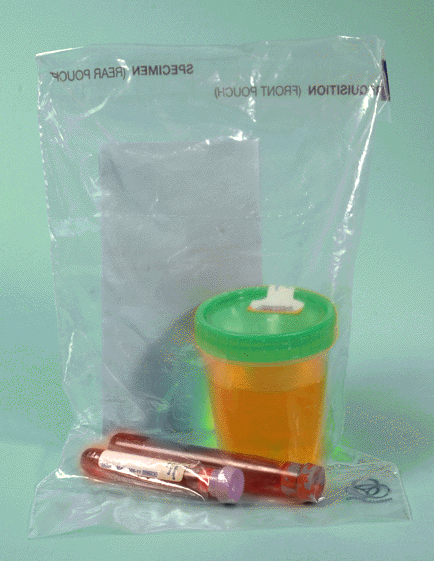 Hudson Poly Bag manufactures custom two compartment medical specimen bags for use in transporting medical specimens to laboratory testing facilities. Hudson Poly Bag delivers on time, on spec and on price. We simply do what we say that we will do. These bags are a two-pouch configuration to accommodate the specimens to be tested and the associated testing requisition form. A permanent adhesive tape is supplied with the bags so that once the bags are sealed; the bag must be ripped in order to access the contents. A perforation across the bag, however, allows easy access for the testing facility. Any unauthorized access to the sealed bags is readily evident. The specimens and the requisition are both sealed inside the bag, but separate from each other. These bags can be fully customized with printed logos; instructions or other desired printed text. With most zip lock style specimen bags, the specimen and the requisition are not secure and it is possible tampering could occur. Hudson Poly Bag’s style specimen bag eliminates this and provides a much higher degree of security and patient medical privacy. The bags shown at right have a working area of 6.5” x 9”. Almost any size can be ordered with up to four-color printing. Delivery is typically 4-5 weeks.